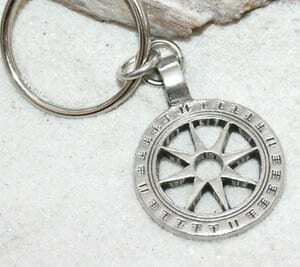 This exquisite Wheel of Life Keychain is handcast and hand-finished in solid American Pewter with a shiny finish resembling antiqued sterling silver. The Key Ring is the classic split ring and measures 1 1/4 inch or 32mm. The Wheel of Life...called the Bhavachakra in Sanskrit...represents the cycle of birth and rebirth and existence in samsara, the four nobel truths and the eight fold path of Buddhism. Namaste.